Tibet Telegraph: IN NORTH KOREA’S ACTS, SOMETHING MORE THAN MEETS THE EYE? IN NORTH KOREA’S ACTS, SOMETHING MORE THAN MEETS THE EYE? A booster rocket test last December expected to be a prototype of a long range missile, a third nuclear test in February with a veiled threat for a fourth test soon, threatening to attack the USA; cutting the hot line with South Korea; withdrawing from the 1953 Armistice that brought an end to the Korean war are acts that could destabilize North East Asia (NEA). This is what North Korea’s new leader, Kim Jong-un has rushed through in the last four months. Now known with the honorific “dear respected”, Marshal Kim Jong-un, grandson of ‘great leader’ Marshal Kim Il-sung and son of ‘dear leader’ Marshal Kim Jong-Il, is still an undeciphered element. There were expectations that Kim Jong-un would be modernised but being young, could be used by senior military and political leaders. Whatever information that has come out of this closed nation is that he may either prove to be better than his famous father and grandfather and rejuvenate the nation, or preside on its destruction. In a very short while he has disposed of or sidelined many, including relatives who were supposed to be his supporters. The third nuclear test may have provoked a paradigm shift in North Korea’s quest for nuclear weapons and long range nuclear capable missiles. It has declared that its nuclear arsenal would be able to strike the USA. Pyongyang’s threat to South Korea has elicited the strongest ever reaction from Seoul which has declared it was ready to take out North Korea’s Command Centre, but hastened to clarify this did not mean Kim Jong-un. Temperatures, however, are rising. Till recently, North Korean threats which come often enough, were not taken too seriously. But strategic assessments began to change when a North Korean torpedo sank a South Korean frigate in 2010, killing 47 sailors. 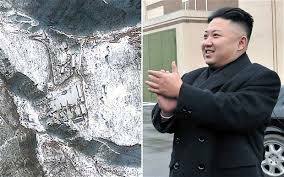 Soon after, the North Korean army shelled a small South Korean island. According to military experts following military developments on the Korean peninsula 70 percent of North Korean missiles are aimed at South Korea. A foreigner visiting the Demilitarized Zone (DMZ), the border between the two Koreas, noted how vulnerable the South is to an attack from the North. On the other hand if such an attack did materialize, little would be left standing in the North. Seoul and the US, which has a military presence in the South, would ensure that. The US-South Korean military exercises are specifically meant to remind Pyongyang to beware of such an eventuality. Yet, there is a niggling fear about what an unpredictable regime could do. This scenario is not only based on a North versus South plus US matrix, but also on a not so rare possibility of serious infighting between opposing camps in North Korea. Pyongyang seems to have become more incensed after the US sponsored UN sanction following its third nuclear test. China had to support the sanctions along with Russia. In fact, China was allowed to fine print the sanctions, blocking Pyongyang’s access to material from abroad to boost its nuclear weapons and missile capabilities. At China’s instance, the sanctions do not prohibit North Korea’s normal trade. Now the onus is on China to ensure the core elements of the sanctions. It must be admitted that China tried its best to dissuade Pyongyang from conducting its recent nuclear test, but failed. Following the test, the North Korean ambassador in Beijing was summoned by China’s foreign minister to communicate China’s displeasure. A shift in public opinion in China against North Korea began to be visible from late 2010. This came from academic and strategic experts who are close to the Party and the government, suggesting there are powerful centres within the system who want to jettison North Korea in China’s interest. The writing and statements were very clear that the top level was making a mistake. The latest article in the Global Times, a Chinese official daily which espouses a hard line on foreign policy, said North Korea was an albatross around China’s neck. It is, however, well known, that in the strategic calculations of the Party’s Politburo and its standing committee, North Korea is an evil necessity. In a recent article in the East Asian Forum, Jia Qingquo, Professor and Associate Dean of the School of International Studies, Peking University, detailed some of China’s compulsions. Though mostly known, the fact that this was allowed to be published in a foreign media forum speaks volumes about the severe internal debate. Prof. Jia said China desires a stable Korean peninsula because a stable North Korea is in its long term strategic interest; a conflict in the Korean peninsula would not only jeopardise China’s security, but also bring with it serious refugee problems. He went on to note China’s reasons to work against a nuclear North Korea, mainly it would prompt South Korea and Japan to do the same; bring a nuclear war close to China’s borders; invite preventive strikes from the USA; lead to North Korean nuclear proliferation including to international terrorist groups. Beyond what Prof. Jia said, there are other strategic interests for China. The longevity of North Korea’s Communist Party, the Korean Workers Party (KWP) is very important for the Communist Party of China. Following the collapse of the Soviet Union, the Communist regimes started folding like a pack of cards. Only the KWP, the Vietnamese Communist Party and the Cuban regimes remained. The Chinese Party faced internal questions. Apart from the other two communist regimes, the KWP was of special relevance. They drew ideological strength from each other. China cannot afford North Korea to establish direct relations with the US. In such an eventuality the ramifications for China will be many. US-North Korea diplomatic relations can bring the US on China’s shoulders. Next step could be reunification of the two Koreas. In that case a situation like the reunification of East and West Germany, might emerge, leading to the emergence of a non-communist Korea. It may lead to an US-led East Asian countries with Japan and Korea strong enough to stand up to Chinese hegemonism. Yet, if North Korea is allowed to go berserk with its nuclear weapons development, it could invite a pre-emptive strike from the US on the country. China will lose its card, and the US will be on its borders. To counter these negative possibilities, China is following a path of trying to trim Pyongyang’s nuclear ambitions, but not kill it entirely, while bailing it out economically. China continues to urge restraint on the part of those concerned countries, and is pushing to revive the six-party (China, North Korea, South Korea, the US, Japan and Russia) North Korean nuclear talks. During US President Bill Clinton’s second term, especially the later half, some attempts were made to redefine relations with the so-called “rogue” nations, Iran and North Korea. Secretary of State Madeline Albright was the moving force. The Bush administration changed all that. While China is the country closest to North Korea and knows the most that is going on there, it can also be said with certainty that Beijing does not know every thing especially its strategic thoughts. How many even in the highest echelons in Pyongyang would know Kim Jong-un’s mind? Very few, though he favours some over others. Marshal Kim gives orders and they are followed. An interesting side show which has not been given importance and reportage in the international media may not be brushed aside with disdain. A well known American basket ball team, the Harlem Globetrotters, was in Pyongyang towards the end of February at the invitation of North Korea. They displayed their expertise, and then played a game in which North Korean and American players were mixed to form two teams. The game, of course, ended in a draw, 110-110! A transparent political game. The Globetrotters had an ex-NBA player, Dennis Rodman. To note, the Globetrotters are an all-African American team. Kim Jong-un watched the game along with his wife Ri Sol Ju. He also invited Rodman and others of the team to come and sit with hm. Later, he attended a dinner hosted in honour of the Globetrotters. The North Korean reportage was full of praise and positives. There was no anti-American rhetorics. That the Chinese official media like the Xinhua is yet to report on the development does not mean Beijing has not taken note of it. It would have reminded them of Mao Zedong’s Ping-Pong diplomacy in 1970, sowing the seeds for a breakthrough with the USA. Have Washington and Pyongyang started playing footsie under the table? Difficult to say. It may be just another of Kim’s teasers. For the immediate, Pyongyang has warned that its nuclear capable ballistic missiles were ready to set the “nest evil”, the US on fire. They, however, have no such capability. But do they have the capability to resort to terrorism, especially nuclear terrorism? There would be terrorist organizations like the Al Qaida hungry for the ‘dirty” bomb. The threat to South Korea is more real. Seoul was attacked in 2010, but was restrained by China from retaliating. Another strike can provoke a strong response from the South. The US has issued a strong warning to the North. What will China do? Views in China advocating measures against North Korea are rising.